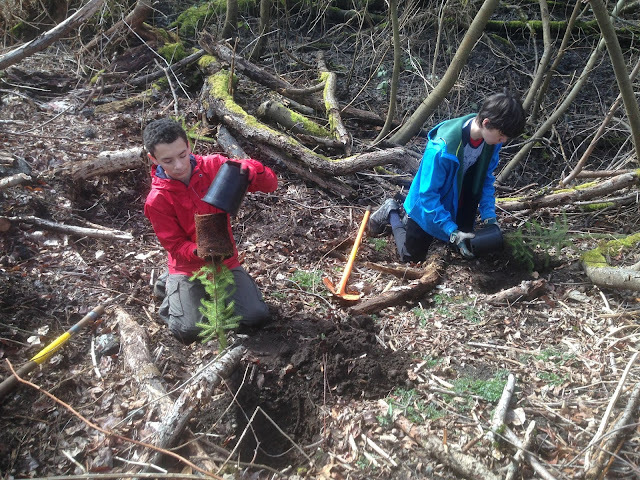 Citizens hoping to honor the upcoming Earth Day are encouraged to help in the restoration of wild lands right in Shoreline at Twin Ponds Park in the southern end. Work continues streamside along the banks of Thornton Creek, where our restoration of the wetland areas challenges us to obtain plants that will grow in water saturated soil and in the less soggy, but damp, areas close-by. Volunteers with gaiters and rubber boots will be most welcome to plant where we want some native trees and plants to shade out and perhaps out-compete the invasive Reed Canary grass that spreads there. We are hoping to have live stakes from Willow trees and sprigs of Bull Rushes for the water sogged creek edges. For damp areas we will have some native Dogwoods and Ninebark shrubs plus sedges and the native Trailing Blackberry to plant. Up on dry land for those with old shoes or boots that aren’t waterproof we still have scattered bits of the always invasive English Ivy and Himalayan Blackberry left to be removed. If you have been reading the notices of work parties in Shoreline you may know that the Park Department is sponsoring efforts to clean up degraded areas of our parks. This work will bring back the birds, insects, small mammals, amphibians, reptiles and fish that need our native plants to survive. Restored Shoreline Parks will improve our enjoyment of nature and enhance our quality of life. Please join this effort as all the work is provided by volunteers. We gather at 10:00am at the southern end of the park in a small parking lot along First Ave NE where NE 150th St would be if it existed, one block north of 149th Street. We provide a large jug of water and some snack bars. We have tools and gloves. Or bring your own supplies. Rain gear and warm layers are suggested as we work in all weather. Organizer Sarah Fulton says that "If you are a volunteer who needs credit for time served please bring forms to be signed. If you are under 18 years of age I will send you a parental permission form to be signed and brought to the work party. "EVERYONE PLEASE LET ME KNOW YOU ARE COMING BY SENDING A NOTE TO: restoreTwinPondsSouth@outlook.com." If you belong to a youth group, Scout Troop, religious organization, service club or neighbor association, please encourage people to join the effort. The work is sponsored by the Washington Native Plant Society and Shoreline Parks.